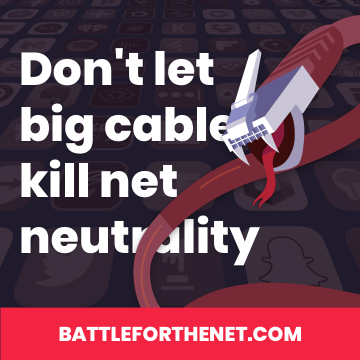 Today the web is coming together to plaster that number across the Internet by driving traffic to the BattleForTheNet.com “scoreboard” — a new tool that makes it easy to find out where your reps stand on net neutrality. Click here to find out if your representative supports net neutrality, and learn what you can do to help out. Big sites like GitHub, Namecheap, Postmates, Pornhub, Tumblr, and Gandi.net will be helping Internet users find out where their reps stand — and providing easy ways to email, call, and tweet them. The online action comes on the heels the first Republican House rep signing the CRA resolution to restore net neutrality. This could unlock a wave of other Republican support for saving net neutrality, but this will only work if they hear from constituents. We have huge momentum right now. Click here to look up where your House reps stand and message them. Then take control of your corner of the Internet — whether that’s your Facebook account or a major website — and ask everyone you know to do the same. You can use the resources here to spread the word.